Website speed matters a lot to blogs, personal websites and small business websites. A fast website can improve your web traffic, sales and SEO. It can also improve your ranking in Search Engine Result Pages. But having a slow website can affect your web traffic, sales and SEO in bad way. Slow website can reduce your 50% traffic; decrease your sales and position in search results. No one wants a slow website. There are many reasons that can slow down your website; having large size images is one of them. I have already shared with you, “How you can speed up your website to load faster”. Making website faster is a challenge. A slow website can washout your hard work that you have did in making website content and design. Studies show that visitors leave a site if it hasn't loaded in 4 seconds. To check your website speed, you need to test your website in online website testing or speed analysis tools. These tools will provide the complete analysis of your website speed and performance. I have shared some Website Speed Test tools in this post, you can try these tools to analyze your website load time and performance. Pingdom is a cost effective and reliable tool to monitoring website speed. This tool use global network of server to monitor your website. Pingdom gives you the complete statistics of your website loading time, images loading time and response time. All tests are done with real web browsers, so the results match the end user experience. 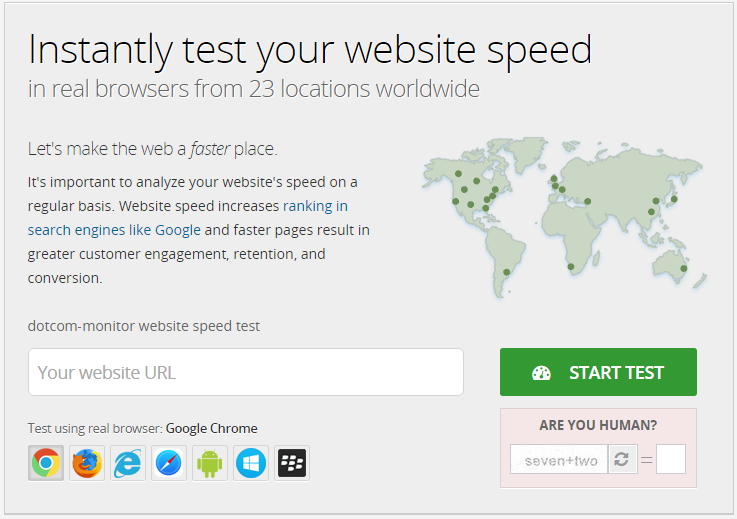 WebPage Test tool helps you to run a free website speed test from multiple locations. You can run a simple test or advanced test including multiple steps transactions, video capture, content blocking and much more. Results will be rich diagnostics information including resource loading, webpage loading speed optimization for improvements. It’s a free website speed test service provider which allows you to check your website speed in 20 different locations around the world. This tool has support for Chrome, Firefox, Internet Explorer and other mobile browsers (iPhone, ipad etc). Dotcom is one of the best tools which is helping its user, webmasters and developers to improve their website performance and we experience. Monitis is a paid tool to test website speed and performance. To test website just enter your web URL and check the details about website speed and performance in result. You can test your website in different countries of US, Europe and Asia. Get the most out of your Monitis experience, Sign up free for 15 days free trail. Website pulse verifies the URL, download the complete HTML content, images, all other internal webpage and measure the download time of each component. It constantly measure website accessibility and web based system performance, immediately triggers alerts and troubleshooting notifications of detected problems and provide to customers with real time data charts, graphics and raw data for detailed analysis. With free Uptrends website speed test you can analyze your websites speed and performance. Simply enter your URL there and choose a location out of 35 available locations. And check details of your website speed analysis. Uptrends tool is free for first 4 weeks. Try free 4 weeks trail. Website speed test is an online tool for testing website speed analysis by Pagescoring.com. It provides valuable information about website speed and domain. This tool will check everything from your domain resolving speed to your download time. With load impact you can get website speed analysis quickly from different browsers, network, conditions, locations and user behavior. It provides most realistic and reliable results. Try free trail. can i use adsense and infolinks on sme web page ? Yes, You can use both Adsense and Infolinks ads at same time on your website. Sign up here to get the latest updates and special offers delivered directly to your inbox. Your details are secured & you can unsubscribe anytime you want.